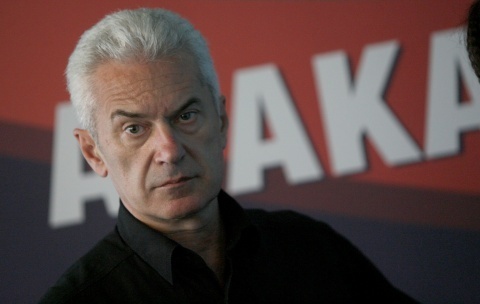 Leader of nationalist Ataka party and presidential hopeful Volen Siderov has called for an extraordinary sitting of the Bulgarian Parliament due to the eruption of ethnic violence in a village that led to 2 deaths. "Parliament speaker Tsetska Tsacheva must call an emergency meeting of Parliament and President Georgi Parvanov must summon a national security council," stated Siderov. Friday night a youth from the Katunitsa village was allegedly intentionally run over to death by a van driven by Roma, after simmering ethnic tensions flared up. Ethnic Bulgarians gathered in protest and vandalized property of notorious Roma clan leader Kiril Rashkov, aka Tsar Kiro. Some 200 riot police have been stationed in the large village nearby second-largest Bulgarian city of Plovdiv. In the tumult Saturday, a 16-year-old suffering from heart problems passed away from stroke, as crowds gathered again, burning cars. Saturday Siderov called for an immediate step down of the regional police directorate head and a resignation of Tsvetan Tsvetanov as campaign head of the ruling GERB party, so that he might resume his duties of Minister of Interior, from which he is on leave. Monday Ataka is organizing nationwide rallys in front of police offices across the country under the moto "Stop the Criminal Neglect of Brazen Roma Crimes!"